Prime Minister Theresa May has committed the UK to eliminating avoidable plastic waste by 2042 as she revealed the long-awaited 25 Year Environment Plan today (11 January). In a speech delivered at the West London Wetlands Centre, May outlined her government’s long-term plans for safeguarding the environment, placing a specific emphasis on plastic waste, while also addressing issues such as the transposition of EU environmental law into UK law, the creation of a new UK statutory environmental protection body (although detail on this was absent in the Plan), air quality, restoring woodlands and ensuring access to green spaces for young people. The scourge of mishandled plastic waste on the environment has been catapulted to the forefront of public consciousness in recent times, thanks in large part to David Attenborough’s BBC series Blue Planet II, which brought the issue into stark relief, and alarming figures on the amount of plastics entering the marine environment, with an estimated 8-12 million tonnes of plastic entering the oceans every year. In her speech, May said: “We look back in horror at some of the damage done to our environment in the past and wonder how anyone could have thought that, for example, dumping toxic chemicals, untreated, into rivers was ever the right thing to do. “In years to come, I think people will be shocked at how today we allow so much plastic to be produced needlessly. In the UK alone, the amount of single-use plastic wasted every year would fill 1,000 Royal Albert Halls. This plastic is ingested by dozens of species of marine mammals and over 100 species of sea birds, causing immense suffering to individual creatures and degrading vital habitats. One million birds, and over 100,000 other sea mammals and turtles die every year from eating and getting tangled in plastic waste. One in three fish caught in the English Channel contains pieces of plastic. Specific actions to tackle plastic waste cover all stages from the production stage through the consumption stage to the end-of-use and end-of-life stages. A call for evidence will be launched in 2018 to seek views on how the tax system or charges, such as those involved in deposit return schemes, could reduce the amount of single-use plastics waste. At the production stage, the government will work with industry to improve the design of plastic products to make them easier to recycle, while it will also explore the possibility of reforming Producer Responsibility systems and extending them to plastic products not currently covered by existing regimes. Work will also be undertaken with BEIS, Innovate UK, Research Councils and industry to bring forward a bid for the next round of Industrial Strategy Challenge Fund awards in 2018, to help develop sustainable materials that will have a lower environmental impact. At the consumption stage, the government will extend the five pence levy on plastic carrier bags to all retailers in England, not just those employing more than 250 staff members. Further policies include removing all single-use plastics in central government offices, supporting nationwide water refill points, and working with retailers and WRAP to introduce ‘plastic free supermarket aisles’. At the end-of-use stage, the Plan lays out ways in which the government hopes to improve recycling rates and make it easier for people to recycle, through continuing support for on-pack recycling labelling and the Litter Strategy and promoting the recycling of drinks containers, as well as shifting to a consistent set of materials to be collected by all local authorities across the UK. The UK will also make efforts to place itself at the forefront of global leadership on tackling plastic waste, helping developing nations do more to tackle pollution and reduce plastic waste, including through the use of overseas aid. 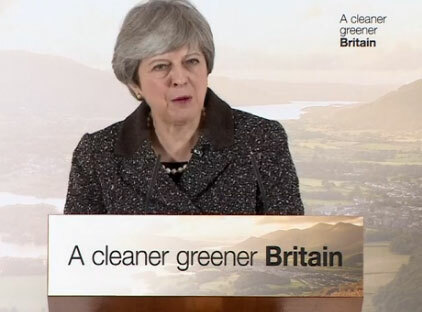 In her speech, May also reiterated the UK’s commitment to achieving clean sustainable growth through its work towards the targets set by the Paris Climate Agreement and the UN’s Sustainable Development Goals, while rejecting the view that sustained economic growth adhering to a free market model is inimical to environmental protection. ‘Minimise waste’ is one of the ten general 25-year goals in the plan, with others including: ‘Clean air’, ‘Using resources from nature more sustainably and efficiently’, and ‘Mitigate and adapt to climate change’. In terms of waste and resources policy besides plastics, the Plan includes policies on reducing food supply chain waste, reducing litter and littering, improving the management of residual waste, cracking down on waste crime and reducing the impact of wastewater. The plan was originally due to be published in 2016, but delays caused by the EU referendum and two general elections meant that it was not ready until last summer. Then, following Michael Gove’s appointment as Environment Secretary, the strategy was delayed once more to allow the new secretary to recast the plan in his image. This delay has, however, seemingly helped the waste and resources industry. A draft that was almost signed off prior to Gove’s arrival last summer only contained half a page on resources, whereas it is now a focal point of the plan. Writing in The Times today, Katie Perrior, May’s former Director of Communications, said that Gove’s predecessor Andrea Leadsom was told to make the plan ‘as boring as possible’, but that since last year’s snap election, the Conservative government has realised the added emphasis on environmental issues in the priorities of the electorate, a realisation that has served ocean plastic, the current environmental hot topic, well. The government’s plan includes further policy objectives on waste and resources, although observers will hope for more detail in the upcoming Resources and Waste Strategy, due for development throughout the year and publication in late 2018. Working towards the UN Sustainable Development Goal to halve food waste by 2030 by aiming to meet the targets made in the Courtauld 2025 Commitment, ensuring that when food and catering contracts come up for renewal in central government offices that departments adopt the balanced scorecard approach, to deliver sustainable benefits to customers and the environment and providing new funding for charities that redistribute surplus food. Actions in support of the government’s Litter Strategy, which will include introducing new regulations to improve local authorities’ enforcement powers as well as guidance on their proper application, developing a national anti-littering campaign and distributing a £450,000 Litter Innovation Fund to explore small-scale research projects, with a view to implementing them on a wider scale. Exploring different infrastructure options for the management of residual waste, such as the production of biofuels for transport, as well as looking at ways to increase the use of heat produced at waste facilities while making them more efficient. Cracking down on waste crime by working with the industry to explore options for the introduction of electronic tracking of waste, and developing a new strategic approach in the Resources and Waste Strategy 2018 to tackle waste crime. The plan has drawn early criticism from environmental MPs. Mary Creagh, Chair of Parliament’s Environmental Audit Committee, said: “Single use plastics are devastating our natural environment, whether they are beads, bags or bottles. The small shop exemption was introduced by the government against the wishes of retailers. Its abolition is long overdue. The more comprehensive the plastic bag charge is, the more effective it will be. “We have been pushing the government to publish the long-promised 25 Year Plan for almost two years. I am sure my committee will want to look closely at the government’s proposals and whether they are ambitious enough to protection our waters, air and soil. 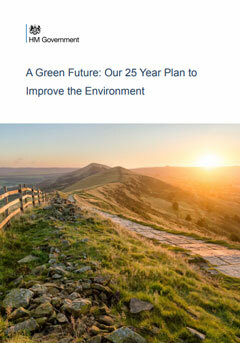 The 25 Year Environment Plan can be accessed on the government’s website. New research shows that David Attenborough’s Blue Planet II series was an effective catalyst for increasing public awareness of the environmental damage caused by plastic pollution. The government’s much-delayed 25-year plan for the environment may not be published this year, after new Environment Secretary Michael Gove reportedly halted its publication in order to give it more personal oversight. The incoming Welsh Landfill Disposal Tax, one of the first new Welsh taxes in almost 800 years, received Royal Assent last week, hastening its introduction west of the border.